Wireless keyboards are quickly gaining popularity due to their versatility and their compact size. Many keyboards work across several different operating systems so you can switch seamlessly between your devices, and they’re a great option for people who like to travel while they work or work on the go. However, there are hundreds of wireless keyboards available, and it can be overwhelming to find the best one to suit your needs. 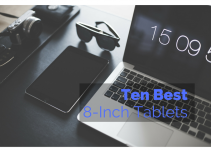 We’ve rounded up the top 10 wireless keyboards for tablets so you can compare them quickly and easily. We’ve also put together a quick buying guide, so you have a good idea what to look for in your wireless keyboard. No matter what you intend to use your new wireless keyboard for, there are a few core criteria you want to consider to ensure you get a keyboard that does everything you need it to do. If you plan to use your keyboard in dimmer conditions or while you travel, you may want to consider one with a built-in backlight. This will allow you to quickly and easily use your computer in any light conditions without an issue. Many keyboards don’t come with this ‘extra’ so it’s important that you double check your choice. Today, many wireless keyboards work via built-in Bluetooth or through a USB connector. They typically have a range up to 30 feet, but this can vary from keyboard to keyboard. It is a good idea to check and see how your new keyboard connects and its range to ensure it works and responds properly. Some keyboards only work with certain operating systems, but it’s not impossible to find one that works interchangeably with iOS, Android, and Windows operating systems. Obviously, you want a keyboard that can connect to all of your devices, and if you have different operating systems, make sure it’s compatible with all of them. Wireless keyboards come in several sizes and some fold over for a more compact design. If you plan to carry your keyboard with you, it’s size and weight are very important. You don’t want something that’s difficult to fit in your bag or adds a lot of additional weight as you go about your day. This keyboard allows you to use it with iOS, Android, Mac OS and Windows for added versatility. It comes in black with seven stylish backlit colors with two brightness levels and auto sleep to prolong the battery’s life cycle. The rechargeable battery lasts up to six months on a single charge with two hours of continued user per day. It is designed to be ultra-thin and lightweight, and it weighs in at just .37 pounds to make portability easy. The package comes with the keyboard, charging cable, 24-month warranty, and a welcome guide. The iPad keyboard features a wide compatibility range and it works with iOS, Windows, and Android computers as well as Bluetooth-enabled tablets, phones, and laptops. It’s compact and it can fit into your handbag or suitcase as you’re out and about or traveling. This keyboard features scissor switch technology for a more comfortable experience and a better tactile response. It has a built-in stand for added comfort, and its compact design makes it easy to take it and go. 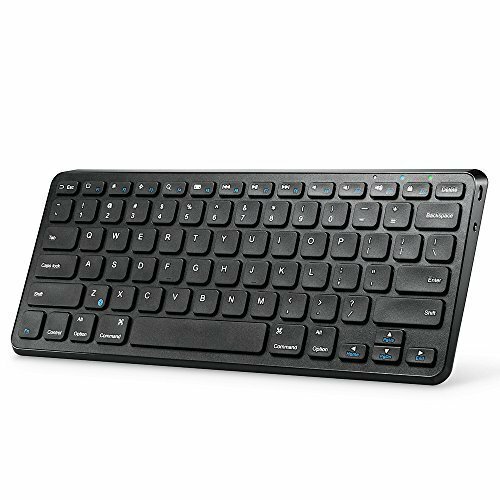 You get the wireless Bluetooth keyboard, a one-year warranty, and an easy to follow user manual. 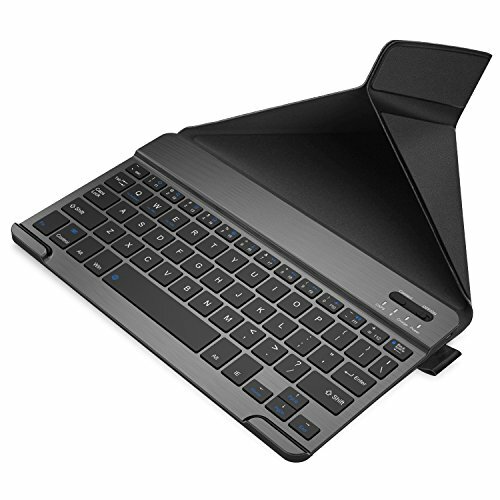 This keyboard has a unique foldable design that is extremely thin. This is excellent for anyone who travels or who has limited space to store their keyboard. It has aircraft-grade aluminum for added durability as well. You’ll be able to use this keyboard with iOS, Windows, and Android operating systems for added versatility, and you get a built-in rechargeable battery. This battery can last up to 560 hours of standby between charges, and it charges in just two hours. It comes with a touchpad function with anti-slip silicone. eJiasu’s versatile keyboard works with your Android tablets, iPhone, iPad, and Windows tablets. This keyboard makes it very easy to switch between these three operating systems for a slick user experience. You get a built-in stand for hands-free operation with scissor-switch keys. It has a very durable aluminum body, and it also comes with an aluminum coating to prevent nicks or scratches. You get the normal keyboard, and it also has function keys, media controls, and shortcut keys as well. There is also a built-in battery that lasts for up to 60 hours on a single charge. This extremely compact keyboard takes up two-thirds the space a normal keyboard does and it’s very lightweight. It has a low profile with a matte finish to enhance your typing experience. It also automatically connects to your last device. 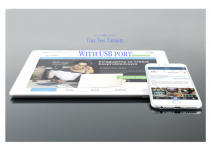 It’s versatile, and you can connect to Android, Windows, iOS, and Mac OS devices quickly and easily. The rechargeable battery lasts up to six months on a single charge, and it charges fully in a few hours. You get the Bluetooth keyboard, 2.3-foot Micro USB charging cable, 18-month warranty, and the welcome guide. 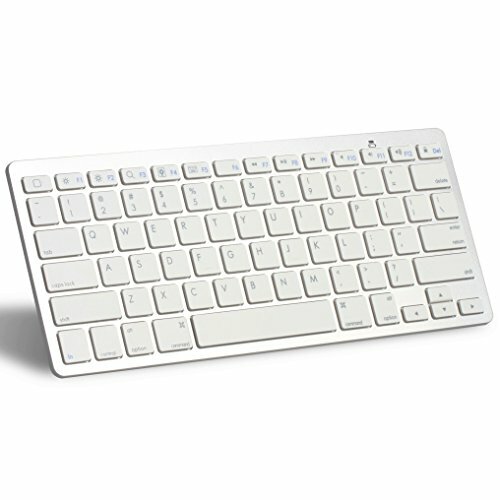 This wireless keyboard gives you the freedom to connect to your PC, desktop, laptop, and surface device quickly and easily. It is made with stainless steel for extra durability, and it has a low profile design. It has a range of up to 33 feet from your device as well. The keys are designed to be whisper quiet and durable, and you also get function keys along with media keys. They’ve taken off the number keypad for more space, and you get up to six months of use on a single battery charge. It’s very user-friendly and easy to setup and install. 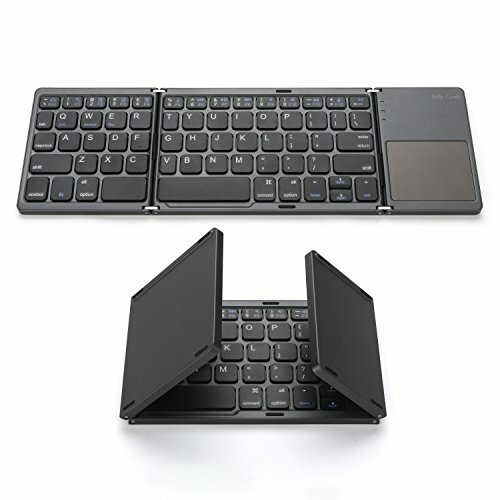 This foldable keyboard is ultra lightweight and slim for easy portability and using while you travel. You can connect to devices with iOS, Android, or Windows operating systems. The aircraft-grade aluminum alloy body adds to the durability of this keyboard as well. It comes with an auto power off and automatic sleep function to help conserve the internal battery. The battery is rechargeable, and you get up to six months of use on a single charge. It works up to ten meters from your device, and you get an 18-month warranty with 24-hour support. You’ll get a unique honeycomb design with this keyboard and it is lightweight and portable. It comes with a backlight so you can type in all light levels easily, and you get multi-touch navigation from the built-in touch pad and function keys. You get a scrollbar as well, and this keyboard works with Android, Mac, and Windows operating systems. It comes with a built-in battery and automatic sleep and off modes to help preserve the battery. 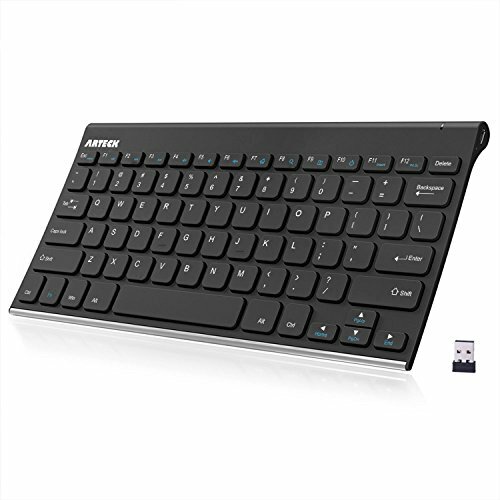 Use this mini Bluetooth keyboard with your phone, HDTV, projector, tablet, laptop, and desktop quickly and easily. 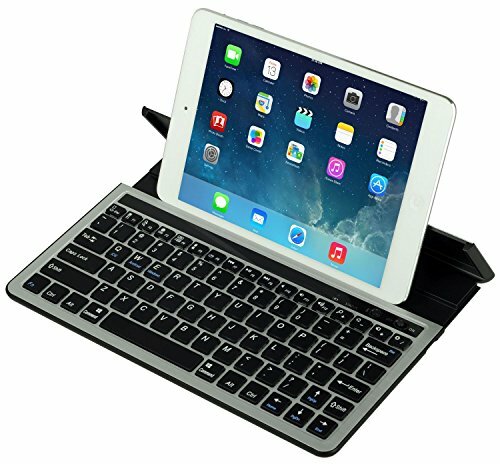 You’ll enjoy a multi-purpose cover that automatically powers the keyboard down and converts it into a tablet stand. It comes with Windows 8 shortcut keys and you get light-touch keys for quick and efficient typing. It also comes with media controls and the Windows Start Key. 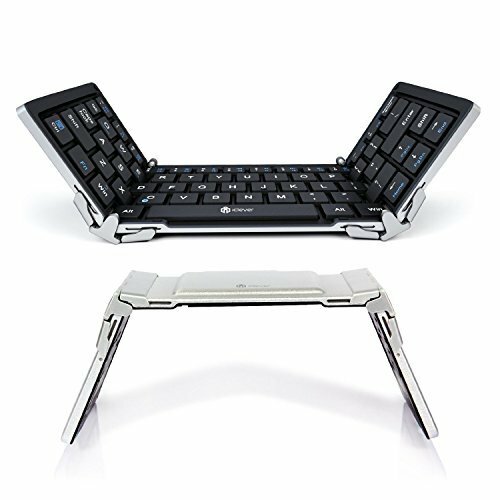 The built-in stand allows for comfortable and easy typing, and it is compatible with Windows, iOS, Mac OS, and Android operating systems. It requires three AAA batteries to run, and it works with most tablets and computers. It is also very slim and lightweight for easy portability and storage. 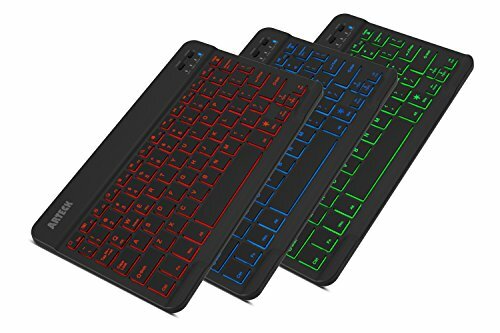 This keyboard allows for cross compatibility across Android, Windows, and iOS devices including tablets, Smartphones, and iPads. It features a very compact and slim design that makes it easy to pick it up and take it with you quickly and easily. You also get quiet and comfortable keys for a seamless typing experience. 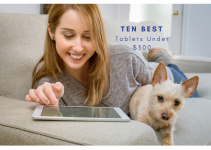 It has an energy-saving mode built-in that will put the keyboard to sleep after 15 minutes of inactivity, and it can last up to 60 days on a single charge. You get a genuine leather cover to protect your keyboard from damage as you take it with you or store it. No matter what you intend to use your wireless keyboard for, it pays to do your research and compare various models to ensure you’re getting the best fit for your needs. Our top 10 wireless keyboard reviews give you a broad range to choose from, and they have all their benefits and drawbacks. Additionally, our buying guide gives you the core components you want to look for when you’re considering a wireless keyboard. Take your time, do your research, and enjoy your new wireless keyboard.